Most Americans do not see widespread support for extremism among Muslims living in the U.S. Overall, 40% say there is not much support for extremism among U.S. Muslims, while an additional 15% say there is none at all. About a quarter say there is a fair amount of support (24%) for extremism among U.S. Muslims; 11% say there is a great deal of support. The share of adults saying there is not much or no support for extremism among U.S. Muslims is 9 percentage points higher than in 2011 (54% today, 45% in July 2011). Views on this question vary widely by age, level of education and partisan affiliation. Younger adults are less likely to say there is support for extremism among Muslims in the U.S. than older adults. About six-in-ten (62%) of those 18-29 say there is not much or no support for extremism among U.S. Muslims, while 20% say there is a fair amount and 10% say there is a great deal. By comparison, fewer than half (43%) of those ages 65 and older say there is not much or no support for extremism among U.S. Muslims; 30% say there is a fair amount and 13% say there is a great deal. A 68% majority of college-educated adults thinks there is not much or no support for extremism among U.S. Muslims; those without a college degree offer more mixed views. About half (49%) think there is not much or no support for extremism among U.S. Muslims, while 27% think there is a fair amount and 13% say there is a great deal. Among those who say they personally know someone who is Muslim, 60% say there is either not much (44%) or no (16%) support for extremism among U.S. Muslims. By contrast, those who do not personally know someone who is Muslim are more divided: 48% say there is not much or no support for extremism among U.S. Muslims, while 27% say there is a fair amount and 13% say there is a great deal. 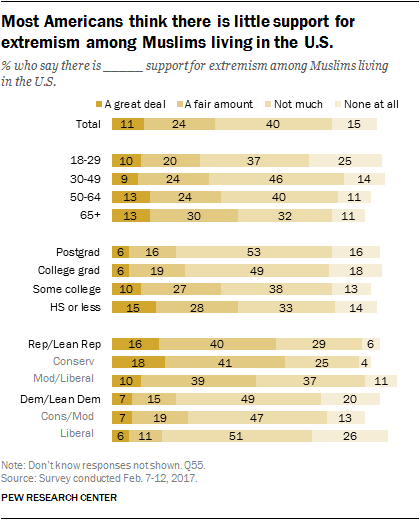 Partisans also are divided on the level of support for extremism among Muslims in the U.S. Relatively few Republicans (16%) or Democrats (7%) think there is a great deal of support for extremism among U.S. Muslims, but 40% of Republicans say there is a fair amount of support, compared with just 15% of Democrats who say this. Most conservative Republicans think there is a great deal (18%) or a fair amount (41%) of support for extremism among U.S. Muslims. By contrast, roughly three-quarters of liberal Democrats think there is not much (51%) or no support at all (26%) among Muslims living in the U.S. While most do not see widespread support for extremism among U.S. Muslims, the public does express broad concern about extremism in the name of Islam more generally. Overall, 83% of Americans say they are very or somewhat concerned about extremism in the name of Islam around the world. When asked about extremism in the name of Islam in the U.S., seven-in-ten Americans say they are very or somewhat concerned. Nearly nine-in-ten Republicans and Republican leaners (88%) say they are at least somewhat concerned about extremism in the name of Islam in the U.S., including 64% who say they are very concerned. A smaller majority of Democrats and Democratic leaners (61%) say they are at least somewhat concerned about Islamic extremism in the U.S., including 30% who are very concerned. 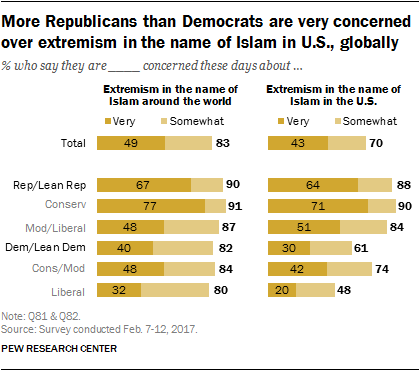 While wide majorities of Republicans and Democrats alike express concern over extremism in the name of Islam around the world, there are differences in the shares who are very concerned. Two-thirds of Republicans and Republican leaners say they are very concerned about extremism around the world, including fully 77% of conservative Republicans. Fewer Democrats and Democratic leaners (40%) express this same level of concern. Concern over Islamic extremism around the world has fallen since it reached its highest level in recent years. 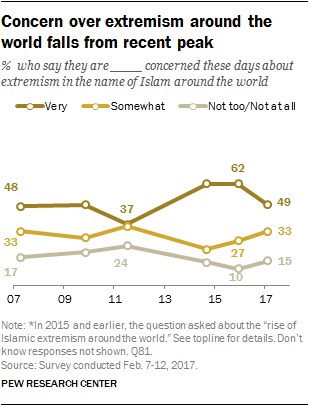 In 2015 and 2014, roughly six-in-ten said they were very concerned about “the rise of Islamic extremism around the world.” Today, about half (49%) say they are very concerned these days about extremism in the name of Islam around the world. Concern over extremism in the name of Islam is tied to attitudes about the policy put forth in Trump’s executive order. Those who are very concerned about extremism in the U.S. are much more likely to approve of the policy in Trump’s executive order than those who are less concerned. Overall, 54% of those who are very concerned about extremism in the name of Islam in the U.S. say they approve of the policy outlined in the executive order. By contrast, 74% of those who express less concern about extremism in the U.S. disapprove of the policy. 4. Attitudes toward increasing diversity in the U.S.